Linda, Miranda, Amy and I went to see the Light in the Piazza at Grady Gammage theater this past Wednesday. It was a fun night out as moms and daughters and a nice musical with some excellent acting, beautiful costumes and creative sets. We all love musicals and everyone in the group, except me, has done some acting and singing…well o.k., I was the narrator in a reading of How the Grinch Stole Christmas in high school and in one church play as an adult many years ago because they couldn’t find anyone else to do it and I sang in a folk band a long long time ago. Later on I decided I would leave the public singing and acting to those who do it best, but I live vicariously through them. I LOVE live theater and singing. When both of our kids were in plays, musicals and choir in high school, I went to every single performance because I just couldn’t stand to miss them. Every night is unique and I just couldn’t think about missing out on a special moment. It touches my heart! I’m so blessed to be able to enjoy times like this. Don’t they look just so cute waiting to go in? Miranda had a gorgeous vintage dress on that could have easily been used in the play, which was set in the 50’s. When we went out to eat afterward, all eyes were on her as she walked through the restaurant. I wish I had gotten a picture of the full dress. Miranda, you’ll have to have someone take a pic of you in it so you can post it. I did learn something about myself that night. Next time if it’s a week night and we decide to go out to eat, I think we should do it before the show, because I was exhausted the next day, trying to get up and go to work. I hope we get to do it again sometime soon. That was a fun evening!! My dress was just so pretty and made me want to go out dancing. What an awesome picture too. 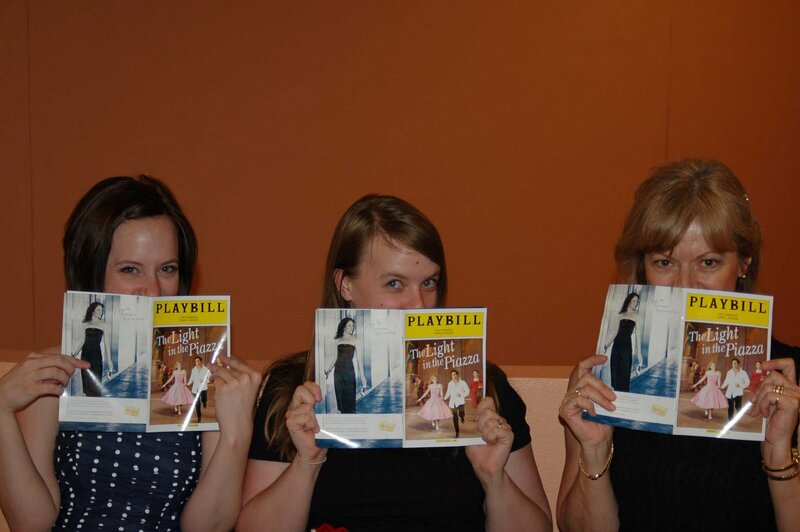 Such a fun night!Love the pic Nancy… wished you had been in it too!We gotta get our girls back into musical theater! Then we could go see them perform and that would make us sooo happy!